The guaranteed experience of a lifetime, is only available to a lucky few, for a limited time each year. Whalesong Cruises, a locally owned family operated business specializes in Humpback Whale and Dolphin close encounters from their luxurious, purpose built vessel. Wide decks and low passenger numbers of 25 to 45 people provides you optimal space to interact with the curious and playful whales sometimes frolicking within metres. On board you will enjoy two levels of spacious enclosed, open air or water level vantage points to observe and encounter a wide variety of wildlife. Capture that perfect breach or sit back and enjoy the cruise, there is seating available for all. Local and national award winners with a crew who love what they do, Whalesong offers convenient cruises daily with expert commentary and interpretation. The Afternoon Sunset cruise offers a light lunch and savoury platter, free tea and coffee available all day. Whalesong is environmentally friendly, reusing and recycling where possible to minimise their carbon foot print. Opportunities to listen to the whales sing underwater may be available. Courtesy pickup within Hervey Bay Fraser Island packages available. Get totally immersed in the Fraser Coasts natural environment and save money on two of the biggest nature experiences of Australia, Humpback Whales and world heritage listed Fraser Island. Explore the diverse natural environment of Fraser Island one day and spend a half day frolicking with Humpback Whales the next, on board the award winning MV Whalesong. New boat. Guaranteed sightings. Low passenger numbers. Let them treat you like their guest. Their decks put you right where the action is. Combine either a morning or afternoon Sunset Half Day Whale Watch Cruise in the calm sheltered waters between Fraser Island and the mainland, with a One Day Hummer Tour. Discover World Heritage listed Fraser Island with a difference on the Award winning one day 4x4 Hummer Tour. Promising exclusivity and style for the discerning traveller; the only company offering the thrill of a Hummer and the exclusiveness of a small group! Current model air-conditioned H3 Hummers, guaranteed small group size - maximum four guests! Friendly and experienced guides. Visit ancient rainforests and freshwater creeks, Lake McKenzie, plenty of time for swimming and photography, freshly prepared catering. Meet up to four species of dolphins and a diverse kaleidoscope of fish, birds, animals and marine life, while cruising the spectacular, pristine Hervey Bay waterways. 'The Hervey Bay Dolphin Watch Cruise' has great protection from the ocean swells, as you cruise along the inside edge of World Heritage listed Fraser Island. Dolphins are guaranteed and the cruise has been operating for over 16 years. The extensive five and a half-hour cruise, includes complimentary morning tea and buffet lunch. There are four different species of dolphins observed often, in these unspoilt water ways. But there is so much more that can be seen, including turtles, birds, sting rays, shy dugongs and different whale species. The new M.V. Whalesong, is environmentally friendly, low carbon impact and was designed to allow guests to cruise in comfort. Enclosed and open air viewing on two levels, a water level viewing area and extra wide, walk around decks, provide the ultimate in extra viewing and seating space. So all guests have excellent vantage points for viewing a wide variety of wildlife or to just sit back and enjoy. Cruises available in June and into July and at other times for groups or private charters. Get totally immersed in the Fraser Coast's natural environment and save money on two of the biggest nature experiences of Australia, Humpback Whales and world heritage listed Fraser Island. Explore the diverse natural environment of Fraser Island one day and spend a half day frolicking with Humpback Whales the next, on board the award winning MV Whalesong. Combine either a morning or afternoon sunset Half Day Whale Watch Cruise in the calm sheltered waters between Fraser Island and the Fraser Coast, with a One Day Tour with Fraser Explorer. Take a swim in a crystal clear waters of Lake McKenzie. Explore Central Station, former forestry camp with huge satinay, scribbly gum, brush box and kauri trees. Walk along the banks of Wanggoolba Creek flowing through lush rainforest. Travel Seventy-Five Mile Beach see coloured sands of the Pinnacles and the wreck of the cruise ship Maheno. Stop for a swim in Eli Creek. Relax and enjoy a hot and cold buffet lunch at Eurong Beach Resort. New boat. Guaranteed sightings. Low passenger numbers. Let them treat you like their guest and their decks put you right where the action is. New boat. Guaranteed sightings. Low passenger numbers. Water level viewing. Extra wdie, stable decks with ultimate viewing and seating space for all. Passionate crew loving what they do. Where the whales and dolphins come to play. Combine either a morning or afternoon Half Day Whale Watch Cruise in the calm sheltered waters between Fraser Island and the mainland, with a One Day Premium Tour with Fraser Explorer. An intimate tour of Fraser Island (20 passengers maximum). Enjoy guided rainforest walk, stop for a swim in Eli Creek, beach time on the famous 75 Mile Beach including Pinnacles, Coloured Sands. Visit Lake McKenzie - a stunning freshwater lake perched in Fraser Island's famous dunes. Times quoted are general for both tours and will depend specifically on guests chosen combination of tours. Enjoy drinks, Hervey Bay king prawn kebabs; mixed gourmet pastries, fresh half shell oysters, half shell Hervey Bay scallops, mixed sushi platter with both seafood and non-seafood choices, chicken kebabs, gourmet meat balls. Potential for new quality items to be substituted or added, and stunning views of the city of Hervey Bay. Start the night by cruising the pristine water ways which lie between Hervey Bay and Fraser Island. Keep a look out for a wide variety of wildlife. Take in the vibrant sunset over the city of Hervey Bay, and then watch as the city lights sparkle along the 13 kilometres of the Esplanade. Cruise past Hervey Bay's monumental pier and then admire the brilliant glow that is the lights of the harbour precinct. Available Friday and Saturday nights November to June with a maximum of 30 passengers on the dinner cruise or larger numbers possible for private charter and groups. Seafood and non-seafood items. Fresh local produce. Let Whalesong design the cruise, function or party that you want. Contact their office for more information. The Morning cruise offers morning tea and a buffet lunch. Free filtered drinking water, tea, herbal tea, coffee available all day. Whalesong is environmentally friendly, reusing and recycling where possible to minimise their carbon foot print. Opportunities to listen to the whales sing underwater may be available. Courtesy pickup within Hervey Bay Fraser Island packages available. Venture to the sandy shores of iconic Fraser Island on this five hour cruise that includes a delicious Aussie barbecue lunch, beach activities and much more. Heading out from Hervey Bay Marina at 9am and returning at 2pm, you'll get a fantastic experience both on and off the boat. Enjoy morning tea as you keep your eyes open for wildlife both in and out of the water - dolphins, turtles, fish and marine birds can all be seen from the vessel on the way from the mainland to the island, so be sure to bring your camera. Their smaller tender boat will transfer you to Fraser island where you'll have one and a half to two hours to enjoy the western beaches of the world's largest sand island, with opportunities for both exploration and adventure or simple relaxation available - go for a swim, traipse along the sand, go kayaking, have a bit of a snorkel or fun fish, or simply take it easy and soak in the Queensland sunshine. Once back on board the boat kick back and enjoy a freshly-prepared Aussie style barbecue lunch including delicious Hervey Bay prawns, juicy steak and sausages, salads and fresh bread. Save money and experience two of the biggest natural wonders of Australia. Get totally immersed in the natural environment of the Fraser Coast. World Heritage listed Fraser Island one day and half day Hervey Bays gentle giant Humpback whales on board the award winning Whalesong Cruises. Where close encounters with Humpback whales are definitely possible. New boat. Guaranteed sightings. Low passenger numbers. Water level viewing. Extra wide, stable decks with ultimate viewing and seating space for all. Passionate crew loving what they do. Where the whales and dolphins come to play. 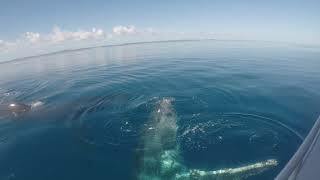 Combine one of Whalesongs Half Day Whale Watch Cruises in the calm sheltered waters between Fraser Island and the mainland, with a One Day Fraser Island tour with Fraser Experience Tours. An intimate tour of Fraser Island (17 passengers maximum). Enjoy guided rainforest walk, stop for a swim in Eli Creek, beach time on the famous 75 Mile Beach including, Coloured Sands. Visit Lake McKenzie - a stunning freshwater lake perched in Fraser Island's famous dunes. The enchanting Maheno shipwreck, Central Station Rainforest. Air-conditioned small four-wheel-drive tour bus with Panoramic windows. Lunch each day, and morning and/or afternoon tea daily. Free non alcoholic beverages including tea and coffee.